Even though Season 7 of Vanderpump Rules just started filming, one major story line is very public. 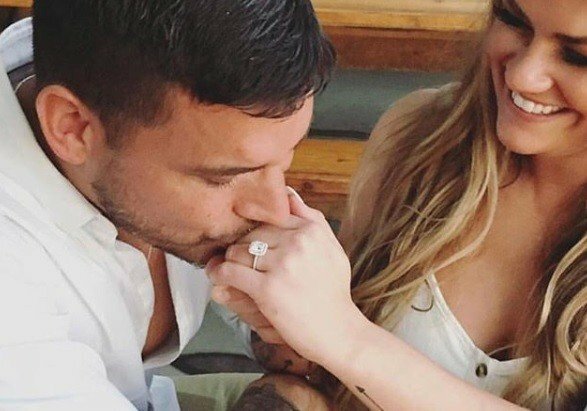 After a hellish Season 6, Jax Taylor and Brittany Cartwright got engaged last week. As of this moment, there’s no word on when the reality stars will tie the knot. Typically the show films each season for a summer, which means that they would have to plan it very quickly if they want to get married during Season 7. The timing may be unclear, but the location is set. And no, it’s not SUR…. or Pump… or Tom Tom… or Villa Blanca. What happened in Kentucky (and ended up on reality TV) did not stay in Kentucky. There is some more relationship drama in store for Jax Taylor and Brittany Cartwright next season on Vanderpump Rules. As someone who has been diligently (and pathetically) watching Brittany unfollow and then follow and unfollow Jax on Instagram, I’ve been very curious about the story behind it. Jax and Brittany teased the upcoming drama in a recent interview. 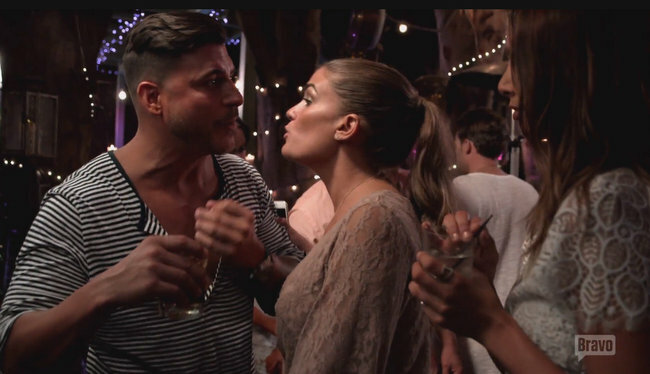 If you’re still watching Jax and Brittany Take Kentucky, the train wreck of a spin off that gave us six episodes to tide us over until Vanderpump Rules starts again, then you probably saw the escalation of Jax Taylor’s bad behavior from a mile away. This week, Jax takes that bad behavior to a whole new level of douchy-ness, resulting in him blatantly disrespecting girlfriend Brittany Cartwright, her family, AND her friends. No one is safe when Jax has had a few tequila shots and feeling homesick for L.A.
We start the episode with Jax actually claiming to be enjoying his farm chores as he gets up early with Mamaw to feed the chickens and the cows. Mamaw is so impressed that this “city boy” is enjoying throwing some chicken feed into a pen and heaps a chicken’s turd worth of praise on him about what a man this makes him. I guess Mamaw is hurting for company since her standards are so low but either way, Jax seems to do no wrong in her eyes. The Vanderpump Rules spin off series with Jax Taylor and Brittany Cartwright has been tough on their relationship. With a show that’s centered around the couple, it’s inevitable that every single argument and offhand comment is going to make it into the episodes. Plus, they don’t have the 343 Vanderpump Rules cast members to hide behind. Not only that, but there’s just no way that Jax insisting that Brittany has “lost her spark” so many times is not going to be featured. 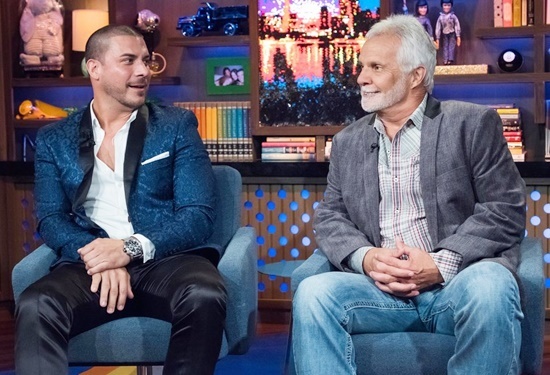 Jax had to answer a lot of tough questions from Andy Cohen when he appeared on Watch What Happens Live. Well, they weren’t exactly challenging questions to answer, but Andy definitely didn’t go easy on Jax. 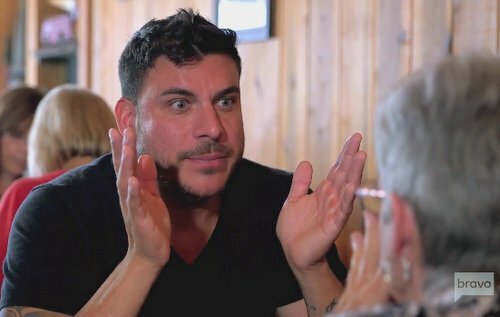 Last night on Vanderpump Rules Jax & Brittany Take Kentucky, the show tries to answer the question that has plagued VPR since its conception: will Jax Taylor ever grow up? That would be a big and resounding NO. Because you can’t fix a 37 year old man who has been slinging his own self-absorbed ego around L.A. since he arrived four nose jobs ago. Just like my title suggests, if you put lipstick on a pig it’s still a pig, even if said pig is Mamaw’s adorable new piglet, Bacon Bit. Just like you can’t make Jax do farm chores and expect him to suddenly be all wholesome. Case in point: after many fishbowls of alcohol, Jax gets belligerent drunk at the bar with Brittany Cartwright and it causes a huge blowup between them. Not only does he try and start a fight with some locals and yells white trash at them, but he also repeately tells his own girlfriend to eff off and antagonizes her best friend. Thankfully, there was no chunky sweater to abandon in a parking lot while challenging someone else to a fist fight this time but clearly, Jax has not come very far since that moment years ago. If you’re still watching with me, congrats! We just barely made it through another episode of Vanderpump Rules Jax and Brittany Take Kentucky. Tonight, we watched Jax Taylor sweat like a literal whore in church and fail at hunting coyotes with the good ole boys thanks to a probation requirement about not handling a firearm. Unfortunately, we still don’t know if poor Brittany Cartwright and her missing spark will ever be reunited and no matter how much she protests that it’s not missing to begin with, Jax is sticking with his story. In an effort to make something, anything even remotely entertaining happen with this show, Brittany is taking Jax to church. As much as she doesn’t want to pressure him with religion, if they get married and have kids, she needs them to attend a Christian church. How’s that for pressure! Jax is wary about the whole thing but agrees to attend. He did grow up Catholic and attend youth groups and church camps, which we can all see obviously had a profound effect on his life. HA! Brittany is wasting her time but let’s just humor her for now.